This above pseudo-invoice came in the mail today. 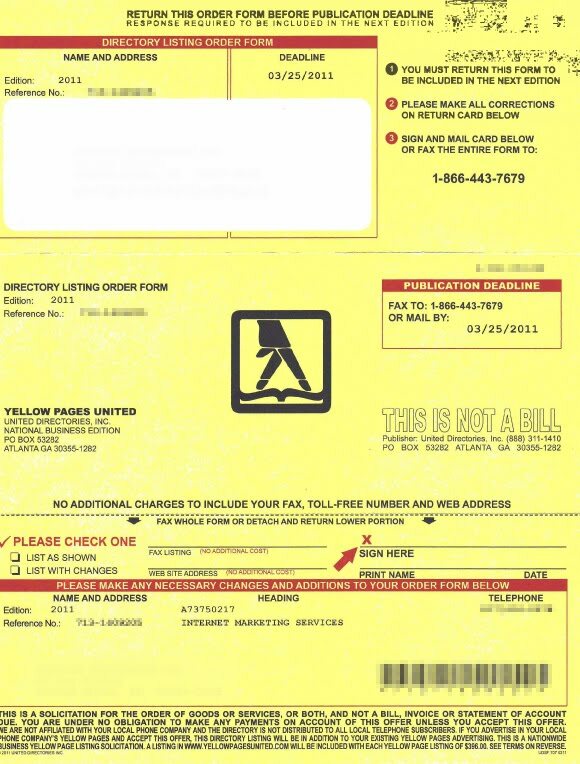 It's an "order form" for a "yellow pages" listing for just $396. Who would fill this out and send money? Apparently 162,000 businesses did. A story from July 2010 on CBSNews.com reports, "Prosecutors say 162,000 companies responded to the money laundering scheme, and although United Directories did, in fact, publish a business directory in 2008, it contained only 55,000 of the 162,000 businesses that had paid for advertising space." According to the story, these guys collected $425 million over a four year period. All they did was send solicitations like the one above and people sent them money. And it's apparently legal. The Jacksonville Business Journal reports that the prosecutors were forced to drop the charges. Moreover, their attorney truthfully claims, "This company has an A+ rating from the Better Business Bureau." It's really a half-truth (which is pretty darn honest coming from an attorney). The Florida Times-Union pointed out that three Better Business Bureau's rated the company. Only one was a A+. The other was a B- and the third was an F, which taken together says more about the Better Business Bureau than United Directories. 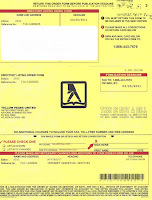 At the bottom of their solicitation United Directories (un)clearly states, "THIS IS A SOLICITATION FOR THE ORDER OF GOODS OR SERVICES, OR BOTH, AND NOT A BILL INVOICE OR STATEMENT OF ACCOUNT DUE. YOU ARE UNDER NO OBLIGATION TO MAKE ANY PAYMENTS ON ACCOUNT OF THIS OFFER UNLESS YOU ACCEPT THIS OFFER. WE ARE NOT AFFILIATED WITH YOUR LOCAL PHONE COMPANY AND THE DIRECTORY IS NOT DISTRIBUTED TO ALL LOCAL TELEPHONE SUBSCRIBERS. IF YOU ADVERTISE IN YOUR LOCAL PHONE COMPANY'S YELLOW PAGES AND ACCEPT THIS OFFER, THIS DIRECTORY LISTING WILL BE IN ADDITION TO YOUR EXISTING YELLOW PAGES ADVERTISING. THIS IS A NATIONWIDE BUSINESS YELLOW PAGE LISTING SOLICITATION. A LISTING IN WWW.YELLOWPAGESUNITED.COM WILL BE INCLUDED WITH EACH YELLOW PAGES LISTING OF $396.00. SEE TERMS ON REVERSE." Aside from being poorly written and presented in all caps with narrow line spacing, reducing readability, it appears that nothing is being promised. If anyone demands that something must be provided, they have themselves covered. When I visited their website, I found my business "listed" exactly as it appears in the white pages. Hmmm. I suspect they "listed" their entire business mail list, sent out the solicitations, and are sitting back waiting for the money to roll in. Paid or unpaid, the companies are listed. Since everyone is listed the directory can claim a service was provided if anyone complains. Apparently the courts don't find this deceptive. I do. If the courts can't stop this, but can drive small businesses under because of the actions of a rogue employee or because the company charges more than a lawyer thinks is right, what use are they? Businesses like this tarnish everyone in business. Practices like these make people jaded and skeptical. This hurts above-board companies that legitimately try and help other businesses and it hurts the companies who need their services, but won't consider them out of fear of being defrauded. I won't even get started on the Better Business Bureau. Deceptive or not, I find it hard to believe that anyone would complete this form, send it in, and send money. Yet they do. If 162,000 business owners responded to this type of marketing, what are the opportunities for companies marketing legitimate products and services? The answer is unlimited, provided the company is marketing. Marketing? I knew there was a catch! 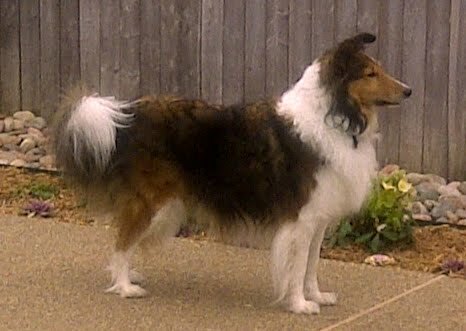 Our Sheltie, Humphrey Bogart, likes to herd things and to protect the house. It's instinctive. Unfortunately for Humphrey, we don't keep sheep or cattle in our backyard and the squirrels and rabbits have learned to keep their distance. So what's a Sheltie to do? Chase aircraft! Humphrey used to leap into the air trying to catch the planes, but never got close. Now, he just barks at them until they leave. As far as Humphrey's concerned, he's chasing the planes away. He knows it's happening because every time he barks at one, it goes away. Online, anyone can say anything anonymously. What if someone says something about your company? How can you defend against it? Click here to read the latest CB Hotmail and learn about ten ways to defend your online reputation. Did you notice how Hank Rearden was unapologetic about making money? Too often, Hollywood, the media, and the government act as though profit is a bad thing. Profitability's not bad. Losses are bad. Bankruptcy's bad. Profitability leads to job creation, increasing standards of living, and investment in the future. There's no future in failure. While Atlas is a story about individualism and liberty, the heroes are entrepreneurs and laissez faire capitalists. Rand celebrates the people who risk everything to create enterprises from the fruits of their own minds. It's about time business is painted in a positive light! In a famous survey by the Library of Congress and Book of the Month Club on its readers' "lifetime reading habits," Atlas was found to be second only to the Bible in "significance to their lives" (as grudgingly reported in the New York Times). If you have never read it, it's a long book. Rand tends to ramble and lecture at times, though always with a purpose. Buy the book now, today. Read it before the movie comes out. It's amazing how a 50 plus year old book is more relevant today than when it was written. One of the advantages to franchising is the ability of a business owner to immediately become part of, and benefit from a well-known national brand. It's instant brand equity, bought at a discount. But what if the brand goes bad? What another franchise operator pollutes the brand? What if you buy a franchise and a nearby franchisee has problems? Worse, what if the franchisee goes bad and it gets picked up by the media, making the brand toxic? Your operation could be golden and yet, your reputation could be tarnished by someone else carrying the same brand in an adjacent territory. The nearby operator may not do anything wrong. He may merely be the subject of a witch hunt by an overzealous prosecutor out to make a name for himself by attacking a business. You can be sure a compliant media will be ready to pile on, calling the business, "unscrupulous," "greedy," and so on. A recent example can be found in a Minneapolis Star-Tribune report on the operation of a national plumbing franchise. I don't know whether the local operator actually did anything wrong or not. After all, many in the media and government consider profit to be wrong. Regardless, the brand as a whole was attacked, not just the local operator. Justifiably or not, consumers piled on. Their comments were harsh and overwhelmingly negative. In today's wired world, this story and accompanying comments won't merely affect franchisees within the readership range of the paper. The story will come up nationwide on Internet searches. It's going to hurt business owners operating under the brand a thousand miles away and could haunt the brand for years. The argument a franchiser will offer in defense is that headquarters monitors franchisee quality and reputation. In practice, for many franchisers, such monitoring is limited. Consumer complaints that reach headquarters are typically turned back to the local franchisee. If complaints get excessive, the power to act is limited by the franchise agreement. The franchise laws that are designed to protect the rights of franchisees can limit the ability of the franchisor to take action. Not only is it legally difficult to remove a franchise, it's expensive. Franchisers will think long and hard before stepping in. If you're considering franchising or licensing a brand, the risk of contamination by other operations using the brand should be factored into the decision. In the case of an extremely well-known and advertised brand, the risk might be worth it, especially if the brand enjoys a stellar reputation. If the brand is one you will be investing in, that is not already established in your market and that requires your efforts to build awareness, why assume the risk that the brand might be polluted by another company? Why not build a brand that you control and that can't be polluted by another operator instead? Why not build your own brand? Are Odors Hurting Your Repeat Business? No doubt about it, the pest control technician reeked. I could smell the cigarette smoke half way across the room, and I have a weak sense of smell. I'm reasonably sure he chain smoked whenever he was behind the wheel, with the A/C on and the windows closed. The smell made it hard to be in the same room. I can't imagine it was good for repeat business. Every now and then I indulge in a cigar. I enjoy the cigar smoke while I'm smoking it, but not the odor that clings to my clothes afterwards. In the act of smoking the cigar, I'm unaware of any bad odors. The next morning, however, the embedded smoke leaps from the laundry hamper to assault my olfactory senses. If I can be unaware of the odor when smoking the occasional cigar, I imagine the chain smoking technician is oblivious to his scent. Yet, the smoker who is aware of the smell and who tries to cover it up with excessive amounts of cologne, aftershave, or perfume is far worse. Now, it's not simply cigarette smoke that's a problem, but an array of odors. It's not only the combination that's a problem. Non-smokers who use excessive cologne, aftershave, deodorant, or perfume can be hurting their business. So can anyone with body odor and/or bad breath. It seems we're more sensitive to odor than in the past. An MSNBC article quoted Dr. Alan Hirsch, with the Smell & Taste Treatment and Research Foundation of Chicago on the subject. According to Dr. Hirsch, "People are no longer being inundated by smoke. They’re aware of the ambient aromas around them and they’re also more sensitized to them." In other words, as fewer people smoke and even fewer smoke indoors, our awareness of all odors has increased. Moreover, women appear to be more sensitive to odors than men. Since women tend to be the decision maker for the selection of home service companies, this gives the elimination of personal odors greater import. What do you do? The best solution is to strive to be as scentless as possible. Use scentless deodorant and breath spray, but otherwise strive to be scent free. Keep extra uniforms on your trucks. If summer perspiration gets excessive, put on the spare shirt. If you must smoke during the day, do it outside, even in cold weather. Use breath spray afterwards. Also, wash or use hand wipes. You or your field service personnel may not be aware of, or bothered by odors, but odors are present, it's almost certainly a problem for some of your customers. That's reason enough to take steps to minimize scents. It's hard to top cute kids. But does it make you want to run out a test drive a VW? Uh, no. For that reason it fails. Doritos and Pepsi had some clever and some disgusting user generated spots that generated the most buzz for their brands after VW (and Pepsi Max needs it can get). Worth noting is the following, rather disgusting Doritos spot, because the door-to-door salesperson who created it only spent $82 according to Forbes Magazine. That's a budget most contractors can afford. Disgusting or not, it does communicate the message that Doritos taste good. Plus, it does a good job of reversing the negative of Doritos' mess. Groupon followed, but their fake "save the Tibetan people" ad generated twice as much negative buzz as positive. Personally, I didn't have any problems with it. I think it accomplished it's objective. Other than the Tibetan thing, the ad highlights that Groupon is a way to buy stuff for less. Mission accomplished. Part of the point is that Apple is now Big Brother. The bigger point is that there's an alternative to the iPad, with different and better capabilities. Mission accomplished. While this year's collection of Superbowl commercials weren't as entertaining as past years, I thought they were more effective as advertisements. Most of them were not the work of agency creatives self-actualizing at client expense. They had a message and conveyed it. Give me an ad that sells over one that entertains without selling any day! Does Johnny Need a Four Year Degree? The Pathways to Prosperity Project, which is based at the Harvard Graduate School of Education, released a fascinating report yesterday titled: Pathways to Prosperity: Meeting the Challenge of Preparing Young Americans for the 21st Century. Do you know what Project Lead the Way is? According to the press release, the report contends that our national strategy for education and youth development has been too narrowly focused on an academic, classroom-based approach. I know what you're thinking, "leave it to the Harvard intellectuals to publish a report stating what you've known for years." I thought that. Then I thought, but what have I done about it? Visit Harvard's site here for the press release details. Here is the link to the Pathways to Prosperity report. If a middle school student asked you for a detailed pathway of education that they could pursue in order to work as a technician or tradesman for your company, could you provide it? The authors of the report discuss Project Lead The Way. It was developed to introduce high school students to engineering. Right now the program involves 3,500 high schools and 300,000 students. I wonder if there might be value in employing one of these students part time, while they go to school? Visit Project Lead The Way to learn more about what they do and for a high school near you. Roy Hauser asked, "Any ideas on how to obtain email address' from our customers? Service Techs say customers don't want to share their address' because of spam." First, collecting email addresses needs to become as routine as getting a phone number. It should not be an option. Include it on the invoice and every other form where an address is requested from the customer. Otherwise, technicians will use the slightest hesitation from the homeowner as a reason not collect the emails. If the tech is afraid of asking the customer for an email address, instruct him to present the invoice to the customer to complete name and address information and authorization (i.e., signature). People are so used to providing email now that many will simply fill in the blank. "We're trying to reduce our impact on the environment and to keep our prices low by communicating with our customers by email rather than postal mail. Would you rather we communicate with you by email or postal mail?" Some may say neither, but that's not being offered as a choice. If the customer is insistent on remaining incommunicado, there's nothing you can do but these customers will be exceptions. You're giving the customer a choice. The choice is between email and postal mail. Most people will choose email. Pressing "delete" is easier than opening and throwing mail away. You might add a third option, which is phone calls. Given the choice between email, regular mail, or phone calls, email clearly wins. However, you should collect email addresses before the technician is dispatched. Some will hesitate to give the call taker an email address. You must give a reason to get an email address. So create one! Approach #1: The call taker tells the customer he/she wants to send the customer a photo and bio of the technician being dispatched and asks for an email to send it. We have a template for this on the Service Roundtable. Approach #2: The call taker informs the customer there’s $5 or $10 internet coupon available and will be happy to email it. On the website, require the customer to enter an email address to receive the coupon. Approach #3: The call taker asks for an email address to send the homeowner a service call warranty. Do you have a better approach? If so, let me know!